"Two hundred years ago, humans drove the dragons from the islands of May. Now, the last of the dragons rises to wreak havoc anew-with only a healer's daughter and a kite-flying would-be hero standing in its way." Jane Yolen is a wonderful storyteller, and she brings her talent for making a world full of magic and old world charm accessible to all of us, through the details she uses to develop each character. The story has a charming old-fashioned feel partnered with contemporary wit. Also, I appreciate that the "hero" and Tansy form a partnership to slay the dragon. Rebecca Guay's art adds to the magic. The dragon and ocean waves jump off the page and pull you into the story. 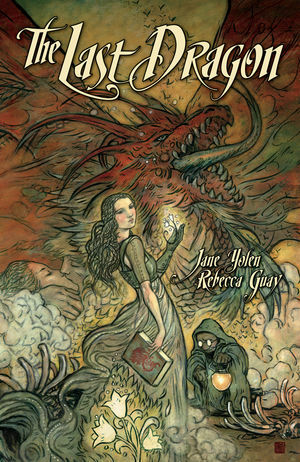 Fans of graphic novels and dragon tales will not be disappointed.